It's the last time Madison DuBois and Mia Hughes will team up for the Falcons, and they're taking aim at the state title that eluded them last year. At the start of this season there were only five players in the Woodinville girls basketball program’s history to score 1,000 or more points in their career by coach Scott Bullock’s estimation. But in one game this month two more names were added to that list. Senior Madison DuBois and sophomore Mia Hughes eclipsed the 1,000-point mark in a district semifinal game against Inglemoor. Now they are preparing to lead the Wes-King champs to the Tacoma Dome for this week’s Class 4A state tournament. DuBois is the senior leader. The one giving rousing halftime speeches with her team down 10 in the KingCo title game that propels the Falcons to victory. The 5-foot-8 Seattle University commit is the Woodinville record holder for most three-pointers in a career and a single season. Hughes and DuBois were on last year’s team that fell to Central Valley in the championship game. There was plenty of drama along the way with all three of Woodinville’s wins in the Tacoma Dome coming in overtime. The Falcons lost six seniors — including three starters — from that squad but still find themselves headed back to Tacoma with the top spot in the Washington Interscholastic Activities Association RPI rankings. With a loaded Class 4A field that includes Central Valley and No. 2 Kentridge, Woodinville (23-3) is hoping for another magical run, but with a slightly different finish this time around. It isn’t just DuBois and Hughes that are making a difference for Woodinville. 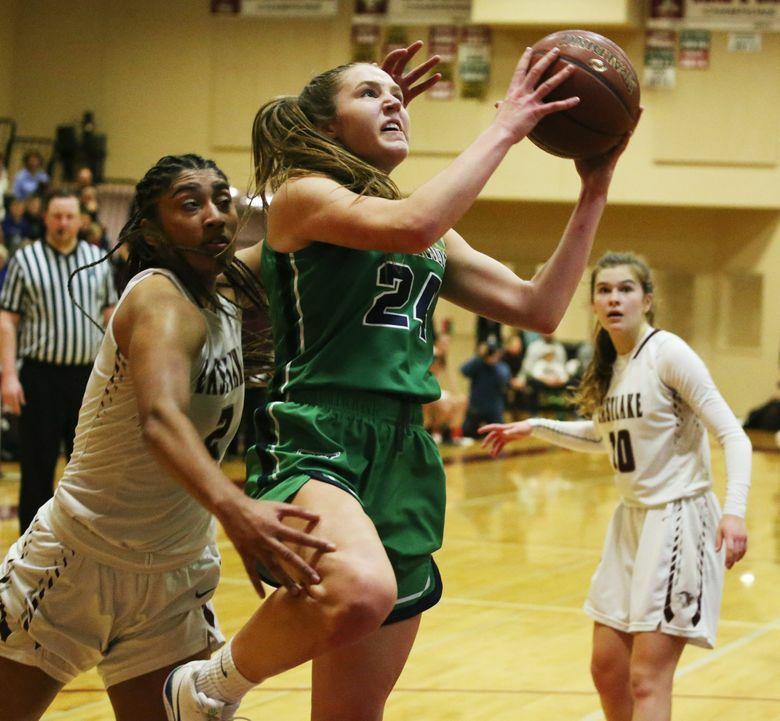 Katie Minnehan is one of six seniors on the team and leads the Falcons in rebounds, steals and assists and 14-year-old freshman guard Veronica Sheffey has jumped right in with 15 points per game for Woodinville. Woodinville dropped its regional game to Eastlake, which ended a 12-game winning streak. The Falcons hope to start a new one in Tacoma. Follow along: Follow @TimesPrepsMattM, @JaydaEvans, @TJCotterill, @aaronlommers and @wiaawa on Twitter. Top storylines: Can anyone stop Kentridge’s posts? The Chargers boast two of the states top players in the 6-foot-4 JaQuaya Miller and 6-2 Jordyn Jenkins, who have provided matchup problems for teams all year. Kentridge finished fourth at last year’s state tournament after winning the title in 2017. … Can Woodinville get past Eastlake? The Falcons’ only two losses in the state of Washington this season have come to the Wolves, including an upset by No. 8 Eastlake in last weekend’s regional round that sent Woodinville to a loser-out game to open the tournament. The Falcons defeated Eastlake in the KingCo championship game and edged Kentridge 72-71 in a nonconference game. … Superstars Lexie and Lacey Hull may have graduated from Central Valley and moved on to Stanford but the Bears are back at the Tacoma Dome for the fourth consecutive season. Senior Tomekia Whitman is leading the charge for the defending 4A champs, averaging 13 points and seven rebounds per game for third-ranked Central Valley. … Glacier Peak’s stout defense has once again led the Grizzlies back to Tacoma after Glacier Peak lost to Lewis and Clark in regionals a season ago. The Grizzlies were the state runner up in 2017, losing to Kentridge in the final. Players to watch: Keeli Burton-Oliver (Eastlake); JaQuaya Miller (Kentridge); Jordyn Jenkins (Kentridge); Jacinta Buckley (Lewis and Clark); Julia Bordeaux (Bellarmine Prep). Favorites: Woodinville and Kentridge. The Nos. 1 and 2 teams in the WIAA RPI rankings have appeared to be on a collision course all season. Kentridge won the 4A title in 2017 while the Falcons got to the title game a year ago before falling to Central Valley. The two teams will have to fend off a loaded field that includes Lewis and Clark and Central Valley from the east side of the state, but each is capable of going on a championship run in Tacoma. Last: In a state tournament full of regulars, can Hazen or Puyallup (Rogers) make a run? Hazen is back at state for the first time since 2009 and only the second time in the last 28 years. After ending its season with a loss in regionals each of the past three years, Rogers (Puyallup) edged No. 10 Todd Beamer 49-45 to earn its first trip to the Tacoma Dome since 2010. The Rams have not won a state tournament game since 1992.